Despite its appearance, this is not a plant. It is a colony of Sea Whips -- a type of soft coral. This colorful species, Ellisella ceratophyta, occurs in many locations throughout the Indo-Pacific region. I photographed this example at Indonesia's Bunaken Island. 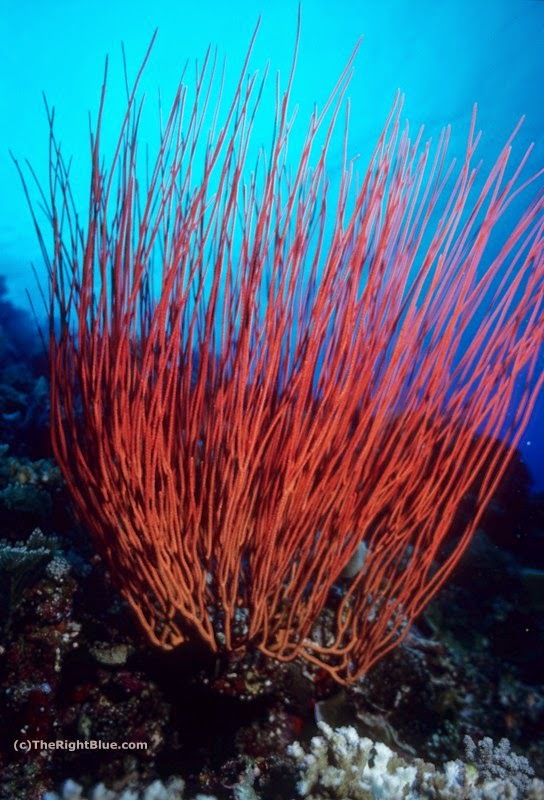 Sea Whips are Octocorals. That is, their polyps have eight tentacles. Like most Octocorals, they feed at night by extending their feathery tentacles to catch tiny bits of nutrients from the surrounding water. The colony pictured here was photographed in the daytime, so its polyps are completely retracted, giving the branches a smooth appearance. To facilitate feeding, colonies of Sea Whips tend to establish themselves in places where there is a mild to moderate current. When the tentacles of the coral polyps are extended, they are able to catch particulates and tiny plankton carried along by the current. We were on a night dive in the Turks and Caicos Islands when we came across this crab. It is a Channel Clinging Crab (Mithrax spinosissimus), the largest species of Caribbean reef crab. How big is he? We estimated that this crab's carapace measured about 15 cm (6 inches) across. If you could measure across its spread-legged footprint, however, it would easily be over to 30 cm (12 inches). We were scanning around with our lights across a sandy area off the coast of West Caicos, when we saw this crab gallumphing along, hunting for his dinner. I had been shooting macro photos earlier that day, but for some reason I did the night dive with a wide angle (15mm) lens on my camera. As it turned out, that lens allowed me to get these wide angle close-up shots of this crab. We located this crab out on the sand flat, at a depth of about 15 meters (50 feet). I maneuvered around in the dark to position myself to intercept its path. I settled on the sand just a meter or so in front of the critter, while Jerry shone a small beam of light on it from above so that I could set up the shot. I waited, and when the big crab was right in front of me, I snapped the shutter release. The result is the first photo on this page. By chance, I managed to capture him just as he began to raise one of those claws in defense! Of course, as soon as the camera's strobe blasted the poor crab with bright light, he decided to leave in a hurry. He 'turned on a dime' and retreated quickly, but not before I was able to capture an image of the posterior of his carapace and those wonderful, bristly, spidery walking legs! 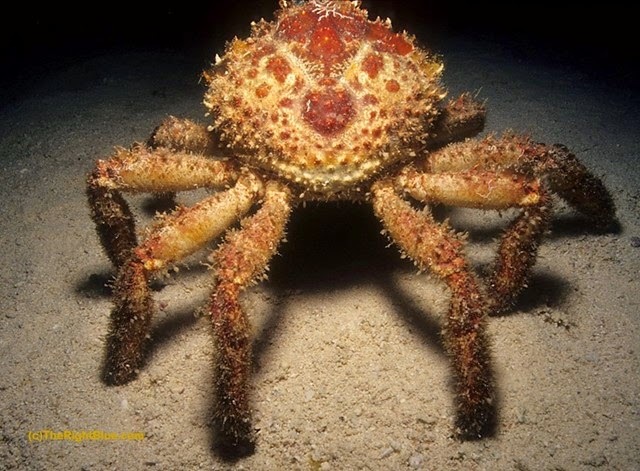 We know this species by the common name Channel Clinging Crab, but it turns out that it has several other common names, including Reef Spider Crab, and Spiny Spider Crab, among others. The crab's scientific name is Mithrax spinosissimus, and that designation stays the same, independent of the common name, which varies from place to place. This crab belongs to the Majidae family and is a 'true crab' (as opposed to, say, a hermit crab). Majidae tend to have long slender legs -- just like this example -- which is why the common names of many species in this family include the word 'spider'. Majids also tend to have little hairs or bristle-like structures on their carapaces. Bits of material -- algae, sponge, and so on -- attach to those hairs and act as part of the crab's camouflage. 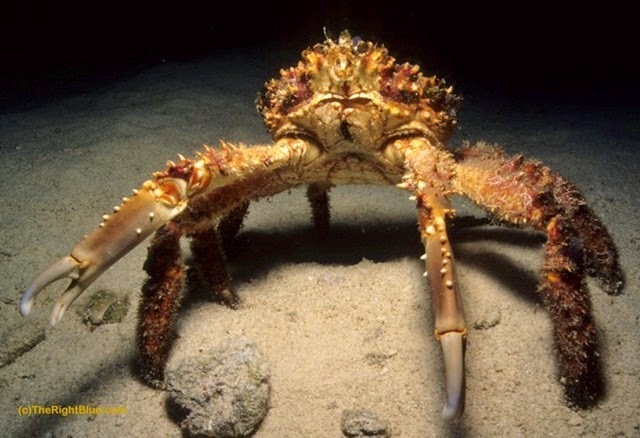 Note that the walking legs of this species also are rather hairy, and are covered with 'stuff' while the business end of the crab -- those impressive claws -- are smooth. Like so many reef creatures, this species forages mainly at night. During the day, they hunker in the reefs, under ledges, and in cavelets. Because of their size, they can't wiggle into small cervices like so many smaller species can do. Still, they can be difficult to spot during the day, since their decorated carapaces blend so well with their surroundings. These crabs inhabit a range from the sub-tropical western Atlantic to the Caribbean. They can be found in reef areas along the coasts of southern Florida, through the Bahamas and the Turks and Caicos Islands, and throughout much of the Caribbean. Have you ever seen a pregnant shark? Someone we know saw a TV program about sharks, and learned that while some shark species lay eggs, others give live birth. He asked us, "Have you ever seen a pregnant shark?" Yes, occasionally we have seen pregnant sharks, and I even managed to photograph one. 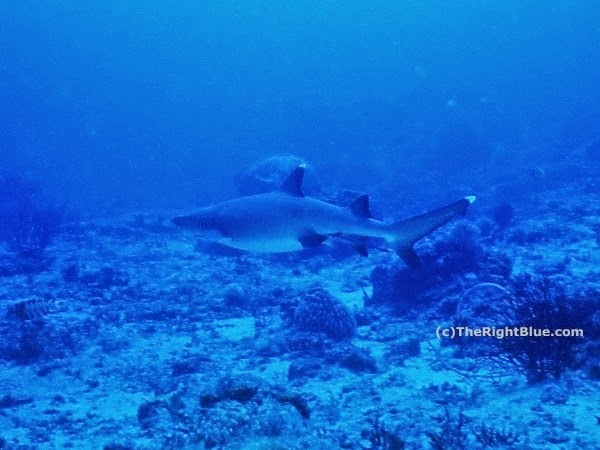 Above is a photo of a pregnant White Tip Reef Shark (Triaenodon obesus) that I took at Sipadan Island, off the coast of Borneo. She looks like she is about ready to pop! This species is known to breed in the Autumn and Winter. The gestation period is thought to be about five months. Whitetip Reef Sharks give birth to litters of two or three pups. As soon as the pups are born they are on their own. The mama shark does not look after the pups in any way. As a comparison, below is another photo, taken on the same dive. 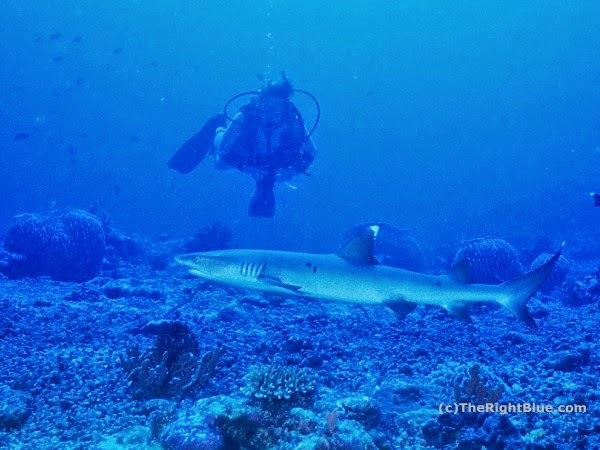 This second photo shows a human observer with a White Tip Reef Shark that is not pregnant. As you can see, individuals of this species are rather slender and sleek -- torpedo-shaped. The poor pregnant female above looks ungainly in contrast. By the way, this location at Sipadan was a shark-lovers' paradise. We had never before (nor have we since) seen so many sharks in such a small area. There were big sharks, little sharks, and medium sized sharks of assorted species. There were sharks swimming, and sharks lying on the bottom resting -- sometimes lined up in rows like parked cars. And there was one pregnant shark! Happy Holidays from The Right Blue! We chose this image for our holiday post because we thought it looked festive. We hope you agree. The photo, taken during a night dive off Providenciales in the Turks and Caicos Islands, shows a stand of Pillar Coral (Dendrogyra cylindrus) with its polyps extended for feeding. 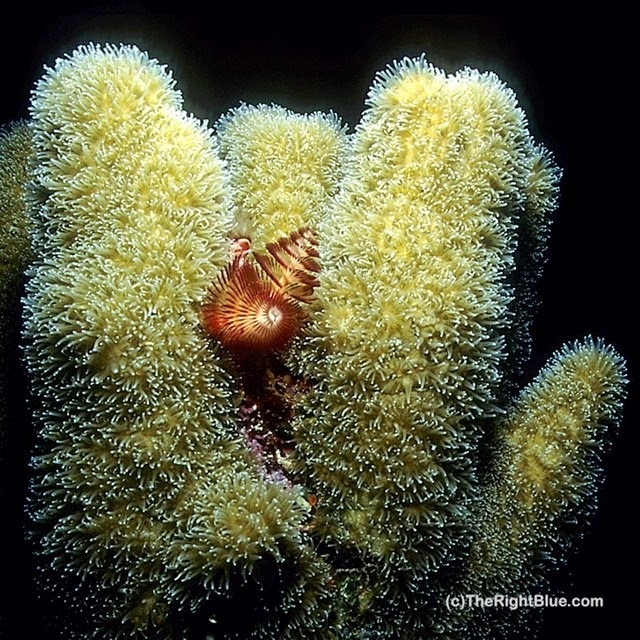 Nestled cozily in the coral is a kind of Polychaete worm called the Christmas Tree worm (Spirobranchus giganteus). The worm burrows into coral and secretes a calcareous tube in which it lives. Only its pair of feathery 'Christmas Tree' shaped crowns are visible outside its tube. The feathery tentacles on the crowns trap tiny tidbits of food, and also are used for respiration. The Christmas Tree worm can retract its crowns into its tube for protection. When the crowns retract, a structure called the operculum closes snugly over the tube like a lid or a little trap door. Christmas Tree worms come in lots of colors: red, orange, yellow, blue, and white. We also have seen a version that is striped! We hope all of our readers are enjoying the holiday season, and we wish you all a very happy, healthy, and prosperous New Year. The Right Blue refers to the goal of a lifelong pursuit. Sea water viewed from beneath the surface comes in many hues and shades. Surfers wait for the perfect wave; divers seek the right blue. What is the difference between 'endemic' and 'indigenous' species?